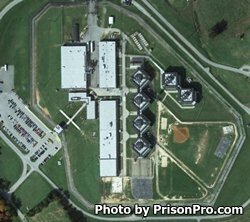 Nottoway Correctional Center opened in 1984 and is a level 3 close custody correctional facility located in Burkeville Virginia. At one point this prison was a level 4 maximum security prison, but has recently transitioned to level 3. The facility is comprised of 63 buildings, and inmates are held in units that include 262 single cells, 128 segregation cells, 502 multiple occupancy cells, and two dormitories. Additional buildings contain a gymnasium, greenhouses, dining halls, administration offices, classrooms, and the correctional enterprise building. The Virginia Correctional Enterprise program employs 83 inmates manufacturing sofas, chairs, and casegoods (dressers, desks, chests etc). Nottoway Correctional Center also operates a 290 bed minimum security work center located just outside the security fence. Inmates at this facility use 290 of the surrounding acres for an agricultural program. Offenders at both facilities receive basic medical, dental and mental health services during their incarceration. Mandatory schooling is required for all inmates who do not have a diploma, inmates can receive both academic and technical training. Visiting at Nottoway Correctional Center occurs on Saturdays and Sundays. The schedule rotates regularly, contact the facility for the current visitation times.